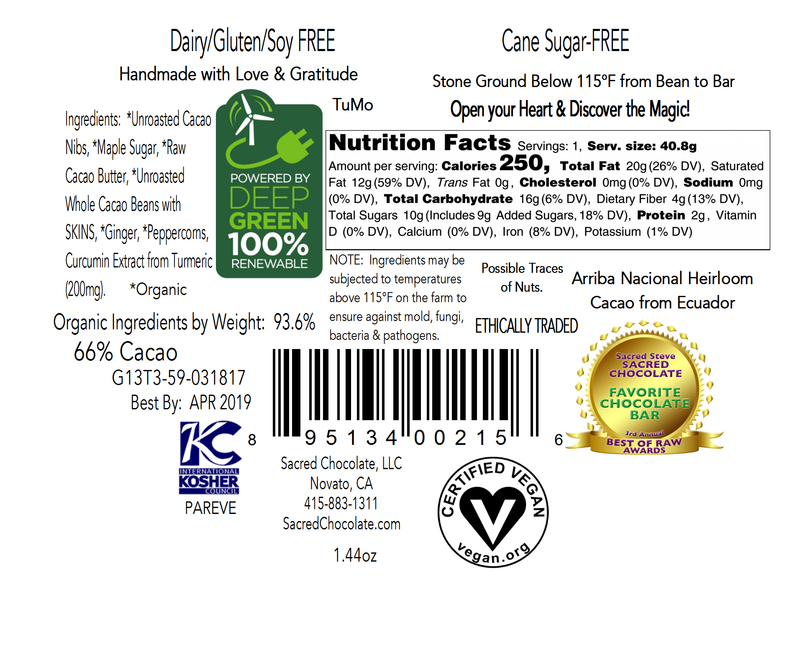 Sacred Chocolate's TuMo heart bar is a true breakthrough in nutraceutical delivery technology. This bar is a ginger and peppercorn dark chocolate at a 66% percent cacao content which includes a special patent pending curcumin extract from turmeric designed to greatly enhance the body's ability to absorb curcumin through a scientifically designed lipophilic delivery mechanism. It's time to get your turmeric mojo on! Tumo means kundalini rising in the Tibetan language, which is an appropriate name for this very special chocolate. Sacred Chocolate's TuMo heart bar is a true breakthrough in nutraceutical delivery technology. This bar is a ginger and peppercorn dark chocolate at a 66% percent cacao content which includes a special patent pending curcumin extract from turmeric designed to greatly enhance the body's ability to absorb curcumin through a scientifically designed lipophilic delivery mechanism. Each 1.44 oz. 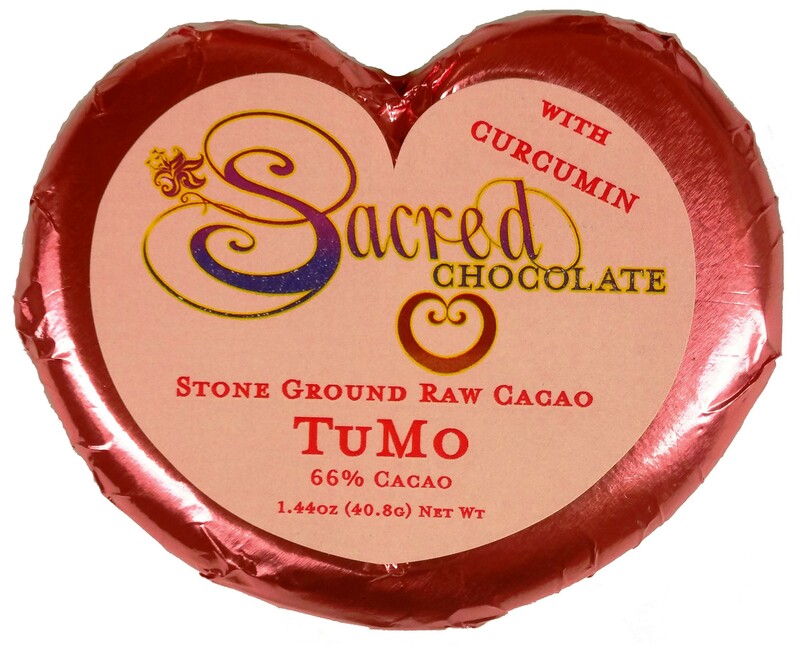 TuMo chocolate heart contains 200mg of curcumin from turmeric root. HOWEVER, this is not like the orange powdered curcumin extract you see in supplement form such as in capsules. That form of curcumin unfortunately only lasts as bioavailable in the human body for about 1 to 2 hours. The curcumin in TuMo can last up to 12 hours in the human body for maximum absorption. Since curcumin is a fat soluable antioxidant, chocolate is the perfect delivery mechanism for it. This bar has been formulated and fine-tuned so that all all the curcumin is highly absorbable, synergistic, and works with the cacao (chocolate) to deliver superior flavor and nutrition. Both the ginger and peppercorns present in the formula act as synergistic pontentiators of the curcumin. As a food, this formula has the potential to deliver significantly greater health benefits than pill or liquid formulations of these super-nutrients. As referenced in the scientific studies below, curcumin is known to promote healthy brain cells and overall cognitive function, reduce the body's inflammatory response and reduce pain as a result, improve cardiovascular health, improve mood, and enhance the health of skin. The Longevity Bliss chocolate bar and TuMo are also designed to work synergistically together in order to create an accentuated effect of curcumin. Xanthohumol, found in our Longevity Bliss bar, significantly extends the half-life of curcumin in the human body. *Unroasted Cacao Nibs, *Maple Sugar, *Raw Cacao Butter, *Unroasted Whole Cacao Beans with SKINS, *Ginger, *Peppercorns, Curcumin Extract from Turmeric (200mg). Organic Ingredients by Weight: 93.6%. 1. Curr Med Chem 2013;20(32):3955-85. 2. Neurology. 1998; 51(4): 1000-1008. 3. Cell Physiol Biochem. 2013 ;32(5):1167-77. 4. J Clin Psychopharmacol. 2008 Feb;28(1):110-3. 5. Int J Biochem Cell Biol. 2005 Feb;37(2):289-305. 6. Int J Biochem Cell Biol. 2009; 41(1): 40-59. 7. J Neurosci Res. 2004 Mar 15; 75(6): 742-50. 8. Nutrition. Sept 2009, 25(9): 964-972. 9. J Pharmacol Exp Ther. 2007 May; 321(2): 616-25. 10. Biochem Pharmacol. 2005 Sep 1; 70(5): 700-13. 14. J Nutr Biochem 2014;25(2):144-50. 15. Int J Cardiol 2009;133(2):145-51. 17. Int J Derm 2010;49(6):608-622. 18. Mol Nutr Food Res 2014;58(1):147-71. 19. Phytother Res 2011;25(11): 1721-6. 20. Br J Pharmacol 2013; 169(8):1672-92.